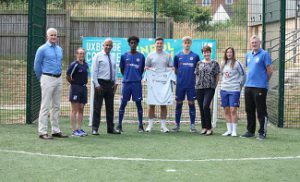 Uxbridge College and Chelsea Football Club Foundation have joined forces in a dynamic association designed to give the best sporting opportunities for students. Uxbridge College Football Development Centre, open to full time students at the College, is now being backed by the Foundation to support young men and women in making the best of their sporting potential. Chelsea Football Club Foundation coaching staff will work alongside the Football Development Centre Head Coach and A Licence holder, Laura Kaminski, to deliver high quality football sessions in first class training facilities and compete in Association of Colleges/English Colleges Football Association league and cup matches. Each member of the Football Development Centre will receive a Chelsea training kit and will play matches in a Chelsea strip. The link will be further enhanced by guest speakers from Chelsea Football Club as well as visits to Chelsea under 23 and youth fixtures, the training ground at Cobham and an opportunity to gain coaching qualifications. Laraine Smith OBE, Principal of Uxbridge College, said: We are delighted and excited to be working in association with Chelsea Football Club Foundation, an organisation that mirrors our own high standards and expectations. The collaboration and support networks available will enable Uxbridge College Football development Centre to further its commitment to providing the best possible opportunities for our students to maximise their academic and sporting potential. It goes without saying that it is fantastic to have world-renowned support such as this and we can’t wait to see our students benefiting from this exciting new collaboration. Keith Harmes from CFC Foundation said: The desire of Uxbridge College to develop a first class football programme shone through at the first meeting. With such excellent facilities and a programme that will undoubtedly be one of the very best the area has to offer, it will be exciting times ahead. Combining academic studies with a fulfilling football programme, delivered by top quality coaching staff, is such a fantastic opportunity for the students. We all look forward to watching the development not only of the college football teams, but also of the individuals involved. Photo caption: Simon Jackson from Chelsea FC Foundation is pictured centre with a shirt signed by Chelsea’s Gary Cahill and Cesar Azpilicueta and donated to Uxbridge College, with two students from Uxbridge College Football Development Centre, Omar Hassan on his left and Adrian Bychowski right. Football Development Centre Head Coach Laura Kaminski (second right) with from left Uxbridge College’s Dan Lloyd, Martina Ashton, Darrell DeSouza, Laraine Smith and Shayne Chandler.